(Size) Diameter 3.8 cm max. 9.7 cm x Height 16.2 cm / approx. 3.82 inch x 6.38 inch. Box 14.5 x 22.7 x 11.1 cm / 5,71 x 8,94 x 4,37 inch. 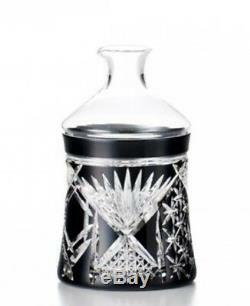 (Capacity) Sake glas 270 cc. (Note) : with a wooden box. Yachiyo Kiriko · Sumiiro (ink colour) is a exellent article that you can enjoy a wide variety of shines by adding. A charming facet and gilt to a deep ink color. Japanese text and English / Chinese text Yachiyo Kiriko Concept Bookmark, a special bookmark that explains the origins of patterns enters. 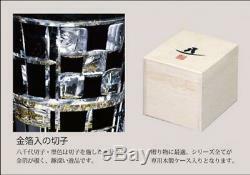 With a special wooden box, it is perfect for hospitality of gifts to important people and day of Halle. If it is urgent, please use EMS which is suitable for the products under 2kg after packaging. It is comparatively safe and stable. Post offices in Japan are usually closed on weekends. Thank you for your consideration. We will not able to accept for you to return the item when you are not satisfied with the item. It was different from what you thought It was not your taste. We try our best to state the information about the item as much as possible. Also, it is more than welcome if you would like to ask questions about the item. If a damaged item is delivered to you, you will need to take a photorecord a movie of the damaged item and send them to me. Hi, May I help you? We carry only wonderful Japanese products. The one made by a traditional craftsman to a small goods that can be used daily. Also, you may find something it gives you a tradition and formality, the antiques that may look refined but it's been aged. By having the base of operation in Osaka where is close to Kyoto and Nara, it's possible to supply the items at the well established antique market. We are willing to do as much as we can so you can enjoy your shopping. It is suitable for daily use, and I have various products which can be used as gifts for your friends. Please feel free to consult me when you may think it difficult to find such kind of products, or wonder which product is better for the celebration. I have ever introduced traditional pottery products to my previous customers who wanted a big clay pot for steamed chicken dishes. Moreover, I have bespoke shop curtains, Shigaraki wares, knife inscription, etc. It's always my pleasure to help you enrich your quality of life. You can always order 24/7 on online. Support team can privide a support English Japanese. We are composed by staff members from Japan and overseas. They understand Japanese products very well and have a profound knowledge of the traditional crafts items and Japanese items. For example, for the case of a plate, we have a knowledge of technical side which is the information of the potter, history of the artist and it was created by using what sort of techniques. We will be able to make a suggestion and give you an advice and enable to match your purpose based on a good stock of knowledge. What all staff members have in common is that they would like you to know how it will be enjoyable by purchasing our item. INTERNATIONAL BUYERS - PLEASE NOTE. These charges are normally collected by the delivering. The item "Yachiyo Kiriko Japanese glass Sake bottle Tokkuri Black Sumi ink kinpaku Kikko" is in sale since Friday, February 16, 2018. This item is in the category "Collectibles\Cultures & Ethnicities\Asian\1900-Now\Japanese\Other Japanese Collectibles". The seller is "kisashi0220japan" and is located in Osaka. This item can be shipped worldwide.